Guillaume Joseph Hyacinthe Jean-Baptiste Le Gentil de la Galaisière (born Coutances, 12 September 1725 – died Paris, 22 October 1792) was a French astronomer who discovered several nebulae and was appointed to the Royal Academy of Sciences. 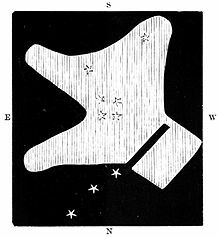 He made unsuccessful attempts to observe the 1761 and 1769 transits of Venus from India. He was born in Coutances and first intended to enter the church before turning to astronomy. He discovered what are now known as the Messier objects M32, M36 and M38, as well as the nebulosity in M8, and he was the first to catalogue the dark nebula sometimes known as Le Gentil 3 (in the constellation Cygnus). Le Gentil's drawing of the Orion Nebula. After spending some time mapping the eastern coast of Madagascar, he decided to record the 1769 transit from Manila in the Philippines. Encountering hostility from the Spanish authorities there, he headed back to Pondicherry, which had been restored to France by peace treaty in 1763, where he arrived in March 1768. He built a small observatory and waited patiently. At last, the day in question (4 June 1769) arrived, but although the mornings in the preceding month had all been lovely, on this day the sky became overcast, and Le Gentil saw nothing. The misfortune drove him to the brink of insanity, but at last he recovered enough strength to return to France. The return trip was first delayed by dysentery, and further when his ship was caught in a storm and dropped him off at Île Bourbon (Réunion), where he had to wait until a Spanish ship took him home. He finally arrived in Paris in October 1771, having been away for eleven years, only to find that he had been declared legally dead and been replaced in the Royal Academy of Sciences. His wife had remarried, and all his relatives had "enthusiastically plundered his estate". Due to shipwrecks and wartime attacks on ships, none of the letters he had sent to the Academy or to his relatives had reached their destinations. Lengthy litigation and the intervention of the king were ultimately required before he recovered his seat in the academy, remarried, and lived apparently happily for another 21 years. During the time he spent in India, Le Gentil examined local astronomical traditions and wrote several notes on the topic. He reported that the duration of the lunar eclipse of 30 August 1765 was predicted by a Tamil astronomer, based on the computation of the size and extent of the earth-shadow (going back to Aryabhata, 5th century), and was found short by 41 seconds, whereas the charts of Tobias Mayer were long by 68 seconds. Le Gentil is the subject of a play by Canadian playwright Maureen Hunter. Transit of Venus was first produced at the Manitoba Theatre Centre in 1992. It was subsequently made into an opera of the same name with music by Victor Davies, presented by Manitoba Opera in 2007, and Opera Carolina in 2010. Le Gentil's own account was published in Voyage dans les mers de l'Inde, fait par ordre du Roi, à l'occasion du passage de Vénus, sur le disque du Soleil, le 6 juin 1761 & le 3 du même mois 1769 par M. Le Gentil, de l'académie royale des sciences. Imprimé par ordre de sa Majesté, two volumes, Paris 1779 and 1781. ^ Timothy Ferris (1988). Coming of Age in the Milky Way. Anchor Books, Doubleday. p. 133. ISBN 978-0385263269. ^ Wright, Michael (2012-02-07). "The Ordeal of Guillaume Le Gentil". Sidereal Times. University of Princeton. Retrieved 14 June 2012. ^ Bill Bryson (2012) . A Short History of Nearly Everything. Doubleday Canada. p. 22. ISBN 9780385674508. ^ Gentil, Le, G (1784). Remarques et observations sur l'Astronomie des Indiens, et sur l'ancienneté de cette Astronomie. Histoire de l’Académie royale des sciences. pp. 482–501. ^ Danino, Michel. "Le Gentil à Pondichéry : de Vénus à l'Inde" (PDF). Synergies Inde. 7: 29–43. ^ Ansari, S. M. R. (March 1977). "Aryabhata I, His Life and His Contributions". Bulletin of the Astronomical Society of India. 5 (1): 10–18. Bibcode:1977BASI....5...10A. hdl:2248/502. ^ Sawyer Hogg, Helen (1951). "Out of Old Books (Le Gentil and the Transits of Venus, 1761 and 1769)". Journal of the Royal Astronomical Society of Canada. 45: 37. Bibcode:1951JRASC..45...37S. ^ Sawyer Hogg, Helen (1951). "Out of Old Books (Le Gentil and the Transits of Venus, 1761 and 1769 continued)". Journal of the Royal Astronomical Society of Canada. 45: 89. Bibcode:1951JRASC..45...89S. ^ Sawyer Hogg, Helen (1951). "Out of Old Books (Le Gentil and the Transits of Venus, 1761 and 1769 continued, with Plate V)". Journal of the Royal Astronomical Society of Canada. 45: 127. Bibcode:1951JRASC..45..127S. ^ Sawyer Hogg, Helen (1951). "Out of Old Books (Le Gentil and the Transits of Venus, 1761 and 1769 concluded)". Journal of the Royal Astronomical Society of Canada. 45: 173. Bibcode:1951JRASC..45..173S.